Written by Ted Marquardt. Updated Jan 15, 2019. There it is. Slowly lumbering around…back and forth. Everyone is keenly aware of its presence. In fact, it cannot be ignored. An immovable obstacle…a disconcerting distraction of mammoth proportions. With it comes a sense of helplessness, as your business and thousands more like it across the country are faced with the five-ton frustration of certification delays for the WOTC (Work Opportunity Tax Credit), and the burden of amended return filings. Any business that submits WOTC applications to state workforce agencies (SWAs) is all too familiar with this ‘elephant in the room,’ that is, the significant delays experienced in processing determinations of certification or denial. And due to the delays associated with the WOTC certification process, this ‘elephant’ causes taxpayers to face the burdensome requirement of amending multiple years of federal and state returns to claim the WOTC in the year qualified WOTC wages were paid. How did the elephant get in here? In speaking with Rachel Zarate Brouwer, Senior Manager of Credits and Incentives at CTI, about the problem of certification delays, she shared several reasons from her 8+ years’ experience managing WOTC projects as to why SWAs struggle to process determinations in a timely manner today, and what issues the future may hold. With the addition of new target group categories, such as when Long-term Unemployed was added to the WOTC program, this caused major delays in certifications as the SWAs were unsure on how to work within their state to validate the added category. Scarce resources, as dictated by state budgetary allocations for processing WOTC applications, results in some states having a very small staff for processing large volumes of applications. The WOTC program is currently slated to end December 31, 2019. When the program ends, the SWAs cannot process determinations after this date. However, the passing of a new legislative bill to extend WOTC is highly expected (but not guaranteed). Because of this, consultants and employers will continue to submit new applications, which could cause a backlog of applications depending on when new legislation passes. The ‘elephant in the room’ can no longer be ignored! So much so that the IRS Large Business and International Division (LB&I) announced on October 30, 2018 the addition of a compliance campaign in recognition of the issues and concerns being caused by WOTC certification delays. The IRS’s approach to addressing LB&I compliance campaigns varies among several ‘treatment streams,’ such as soft letters, issue-focused examinations, published guidance, and revised internal procedures, among others.2 How the IRS will proceed remains to be seen. In anticipation of the IRS’s treatment for this compliance campaign, as a taxpaying business that participates in the WOTC program, you should determine any federal tax return issues you have or potentially may have. When attempting to review your WOTC program and tax return filings, be like an elephant and don’t forget to consult a tax specialist who can confidently navigate and manage the complexities of a WOTC program. 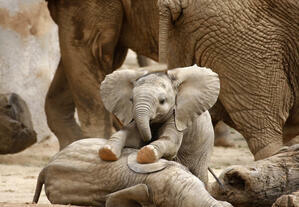 Let CTI’s elite tax professionals tame that elephant for you! Partner with our experienced professionals who excel at delivering personalized service, monitoring your WOTC state agency applications, and quickly resolving issues to obtain prompt certificate approvals. Schedule your complimentary WOTC consultation today.